Detroit's Hart Plaza viewed from the Veteran's Memorial Building. 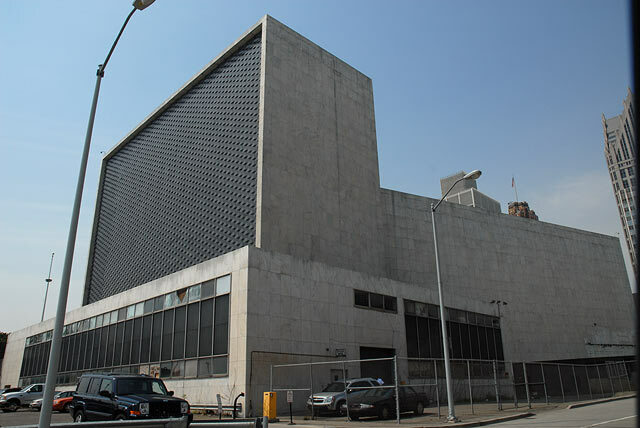 Below: The Ford Auditorium was constructed as the home of the Detroit Symphony Orchestra. However, its inferior acoustics, somber appearance and, ultimately, awkward location which broke of the flow of the riverfront parkland made it a candidate for removal. The dramatic restoration of the nearly acoustically perfect Orchestra Hall led to the abandonment of Ford Auditorium and nearly two decades of abandonment and decay. Below: Partiers at the Detroit's Electronic Music Festival, cavort in front the the Noguchi Fountain, centerpiece sculpture of Hart Plaza.